Its goal is to let you connect very easily (no account creation needed) to the network and join various chatrooms, immediately. 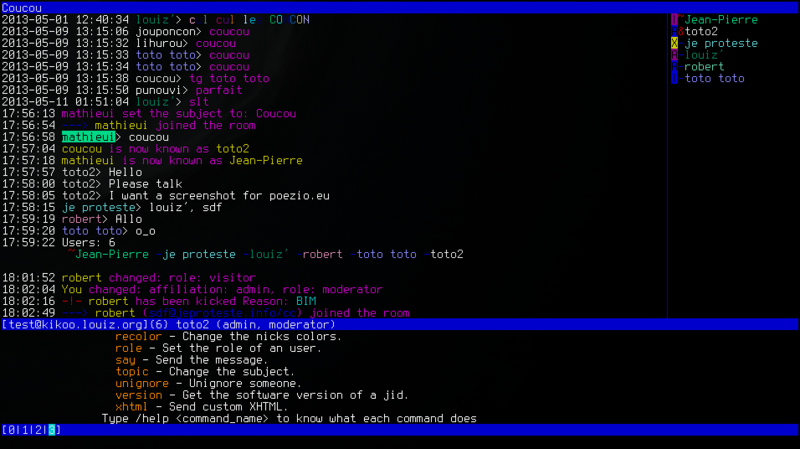 It tries to look like the most famous IRC clients (weechat, irssi, etc). Many commands are identical and you won't be lost if you already know these clients. Configuration can be made in a configuration file or directly from the client. You'll find the light, fast, geeky and anonymous spirit of IRC while using a powerful, standard and open protocol. TLS, OTR, always chat with encryption. Discuss on your favorite topics with your friends or strangers. Switch devices while staying in the same conversations without losing messages. Add the features you want through official or other plugins. Fix your last sent messages. Send and receive messages with colors and formatting. See the writing status of your contacts. Use XMPP without an account. The development version is recommended. Then, you can use ./update.sh to update the sources and the dependencies, from time to time, if you want to test the new features, and be able to report bugs to us. The forge used by both poezio and slixmpp has migrated from redmine to gitlab. Poezio 0.12 has been released, with many improvements and bugfixes. Poezio 0.11 has been released. It fixes CVE-2017-5591. Poezio 0.10 has been released, and includes a lot of improvements, see mathieui’s blog or the changelog file for more details. Poezio 0.9 has been released. It now uses slixmpp, and includes a lot of other improvements, see mathieui’s blog or the changelog file for more details. Poezio 0.8.1 has been released. It fixes the build with python 3.4, there are no other changes. Poezio 0.8 has been released. Please update your packages according to the documentation. Poezio 0.7.5.2 has been released. It’s just a maintainance release to synchronize poezio’s and SleekXMPP’s version. Poezio 0.7.5 has been released. Poezio is now using git. Please update your package, sources, scripts, etc. Documentation for the git version is available at doc.poez.io. Documentation for releases is also available: 0.11, 0.10, 0.9, 0.8. To contact us, you can join the jabber chat-room at poezio@muc.poez.io. We understand English and French. The bug tracker is located at dev.poez.io. I've tested poezio but I don't like it, what can I do? Explain what you don't like, on the XMPP chatroom or on the bugtracker. Mcabber. A console client that does not handle anonymous authentication, but handles the roster and the MultiUserChat. Profanity. A console client started around the same time as poezio. Weechat. An IRC client, but it can handle XMPP thanks to a plugin (does not handle anonymous authentication nor chatrooms for now). Primitivus, the console part of the Salut À Toi project. Other clients, not necessarily console-based. Why is poezio released under the zlib licence, why did you choose to switch from GPLv3? Even if poezio is clearly a free (as in freedom) software, and not just open source, we don’t want to forbid the reuse of part of its code in any other free software. GPL is incompatible with a lot of licenses and that forbids a lot of collaboration between different free softwares. The zlib license, however, lets the code be reused in almost anything, avoiding all the burdens of licensing issues. Of course that also means that poezio can also be redistributed without the sources, but we trust users to value their freedom and avoid any such version. It’s “poetry” in Esperanto. And the reason why we named Poezio like this, is because a lot of softwares/library/documentation/protocol elements are named after things from literature. For example Prosody, stanza, all the references to Romeo and Juliet in the various XEPs.